These are some questions you may like to discuss in your group or consider individually following the sermon this week. It is not intended that you consider all of them in one sitting, and you could use or or two of them at a time as a daily devotional throughout the week. On February 24th we focussed on Psalm 23. 1. Read Psalm 23 perhaps in a different version or translation and see what differences there are. You may like to look at the NIV, The Message, The Amplified, the ESV and the King James. If you download your bible you can easily access these different versions otherwise you may have them as books on your shelves. What do you think of this psalm? Is there anything in particular that stands out for you? 2. Why do you think David wrote this psalm and why is it so popular? 3. The verses say ‘he makes me lie down……he leads me beside quiet waters, he refreshes my soul’ How often do you set aside extra quiet time rather than just your daily devotional times so that you can be deeply refreshed? Why is it important do you think? 4. God promises to be with us through the darkest valleys. Encourage others by sharing a time you walked with the Lord through a difficult time and how he saw you through. 5. What comfort do you get from knowing God is full of goodness and love? 6. What do you think dwelling in the house of the Lord forever will be like? 7. Try to share God’s assurance from this psalm with someone this week. 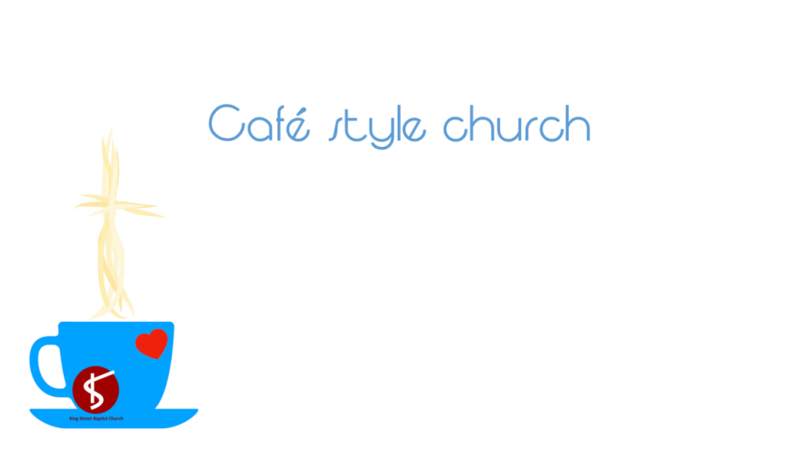 Please join us this Sunday February 24th for cafe style church, which will be led by our Minister Sally Sago. Tea, coffee, cake etc will be available throughout as we do activities together sitting around tables. Everyone welcome, adults, young people and children. We start at 10:45am and finish around 12:15. 1. What is the thing that strikes you most from this passage of scripture? Why? 2. 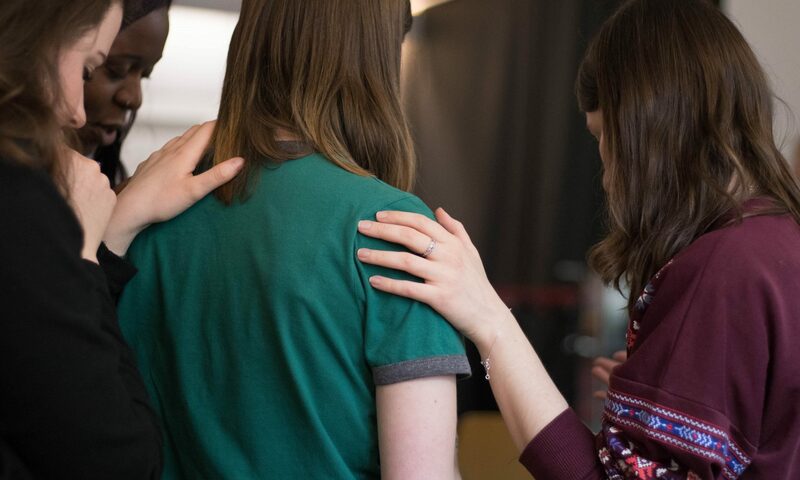 ‘Do whatever he tells you’ John 2:5 How good are we at doing this faithfully every day in response to Jesus who is the Lord and has authority over our lives? 3. Imagine you were one of the servants filling the water jars – how would you react when you saw what happened? 4. Have you known of or experienced Jesus’ healing or miraculous power in your own life? Share with others if you are able. What effect did it have on you? 5. What spiritual disciplines do you think there are that we should live out in our daily lives? Is there one in particular you could plan to work at in the next few weeks? 6. How important is Communion to you? Why? Do you think we celebrate Communion often enough as a holy sacrament? How does Communion impact your faith? 7. This is Jesus’ first miracle – what other miracles can you think of and what do you think they each achieved? Pray this week that as a church family we would know the transforming power of the gospel and be able to share it with others. Please join us this Sunday February 17th when our service will include communion. Our Minister Sally Sago will be bringing us this week’s message, and will also be leading the band. Everyone welcome, we cater for adults, children and young people. We start at 10:45am. 1) What does this passage tell us about Jesus and who He is? 2) What encouragements do we have from being united with Christ (v.1) and how much do we experience of them? 3) What should our attitude (mind) be towards others (3-4) – and what is it in reality? 4) What was the attitude (mind) of Christ Jesus (5-8) and what can we learn from it? 5) How can we follow His example in making ourselves nothing (7)? How willing are we for this? 6) What was the end result of Christ’s attitude? How does it make you feel when you read of God’s purposes foretold by Isaiah 45:21-25 and Daniel 7:9-14? 7) Read Ezekiel 34:11-16. How do we see this fulfilled in Christ Jesus? 8) Read Acts 4:7-12. What do you know about the power of the name of Jesus Christ? How can we know more? Just a reminder of our new venture starting this Thursday February 14th, a drop in play space for tots called Kidz n Coffee. Please spread the word to all those in Thetford with pre-school children. This coming Sunday February 10th we are pleased to welcome back Tony Burton from Ipswich as our speaker. Please join us, everyone welcome, adults, children and young people. We start at 10:45am and we are located opposite W H Smith in the King Street pedestrianised area of Thetford, postcode IP24 2AP. 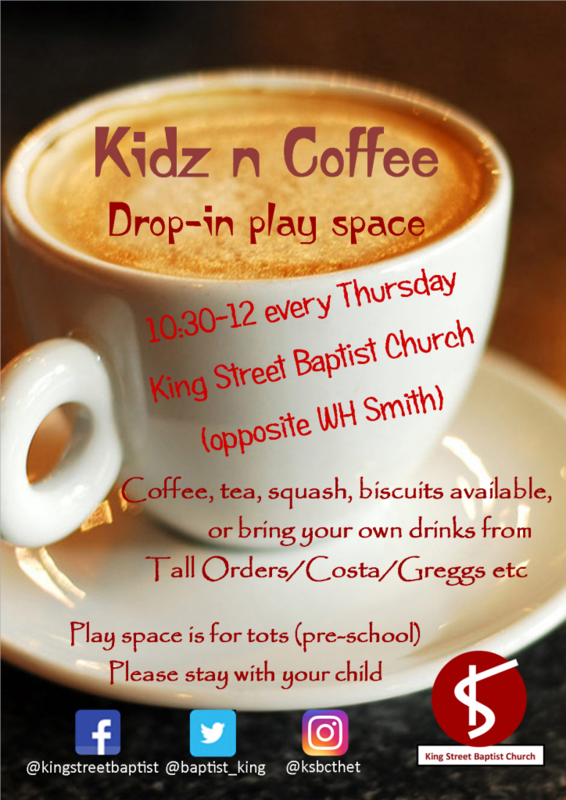 King Street Baptist Church is very pleased to announce a new venture starting Thursday February 14th, a drop in play space for tots called Kidz n Coffee. Spread the word to all those in Thetford with pre-school children. It will be held every Thursday but not until February 14th! We hope you can join us this Sunday January 27th for cafe style church at KSBC, which will be led by our Minister Sally Sago. Tea, coffee etc will be available throughout our time together. Everyone welcome, we cater for adults, children and young people. We start at 10:45am and we are located opposite W H Smith in the King Street pedestrianised area of Thetford, postcode IP24 2AP.